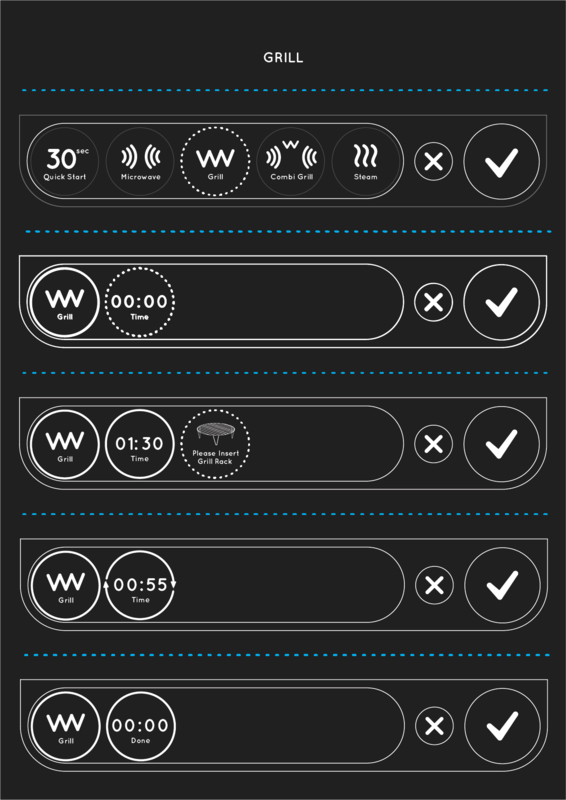 Redesign of the Whirlpool MAX 109, based on professionally set up user tests. Whirlpool Bubble is our redesign for the Whirlpool MAX 109 microwave. We’ve conducted a professionally set up user study to test the original microwave and found many usability issues. 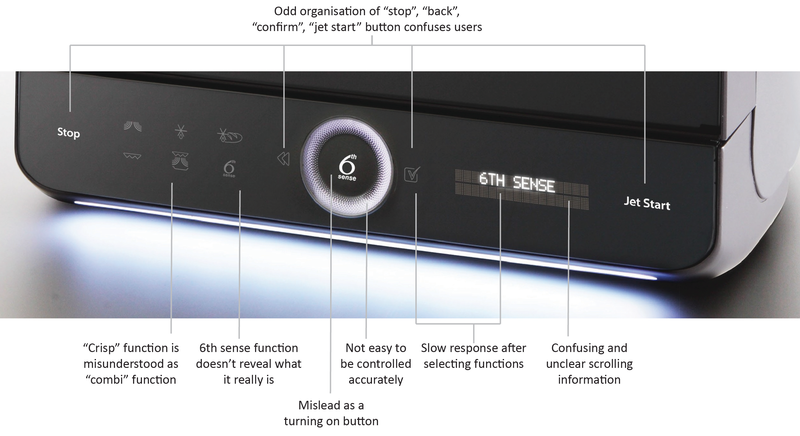 Based of this study, literature research and intermediate surveys, we completely reimagined the user interface to make it easier and clearer to use and made slight alterations to the exterior design to make it friendlier and more ergonomic. This redesign was prototyped and subjected to a second user test, which proved to have resolved many of the errors. The final finishing touches were added from this second study which resulted in the Whirlpool Bubble. Stop motion concept video of our redesigned Whirlpool Bubble. We started with comparing the Whirlpool MAX 109 microwave to similar products and found it to have a very narrow target group and special features that no other microwave has. 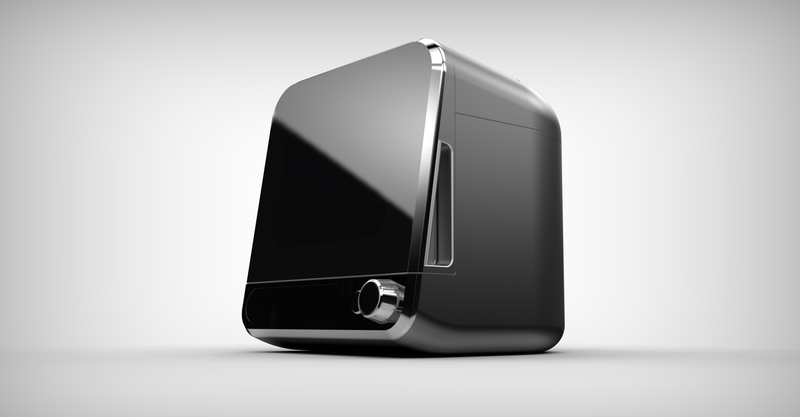 It’s also a very small and compact countertop microwave. Two active Whirlpool MAX 109 microwaves, left is steaming, right is on crisp function. From the literature research we concluded, among other things, that a touch interface is not optimal for such microwaves. Then we did our first user study to test the product with users and to see which problems occur. The perception of the user is different to what is actually happening. The user interface does not guide the user in its hierarchy and communication. The user interface is inconsistent. Users easily gets lost in the sequence. 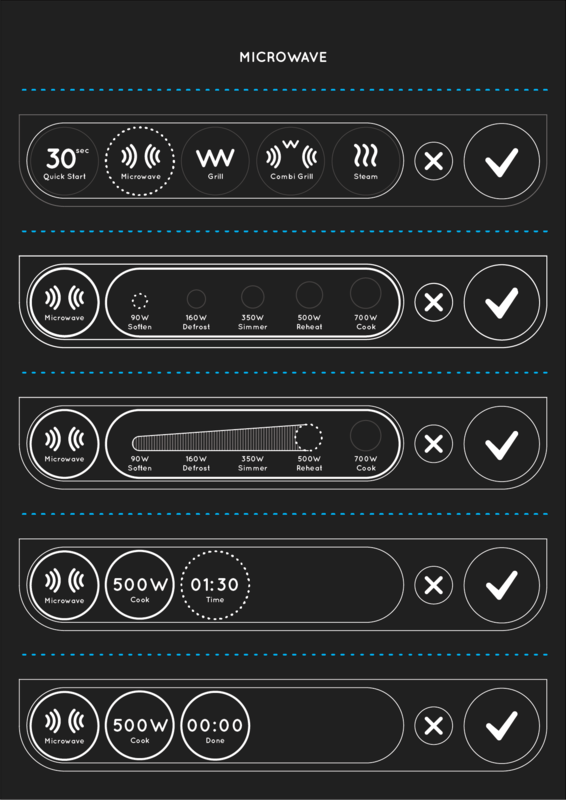 Interface issues with the Whirlpool microwave, highlighted by the 1st user study. 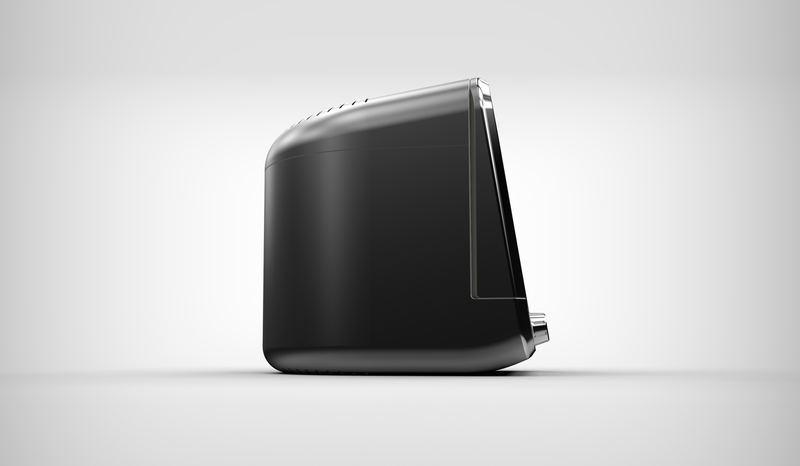 The microwave should communicate with clarity to the user and be reliable in its use. We started designing and after several concepts, we came up with a completely new interface. The new design has just three buttons and big rounded display. 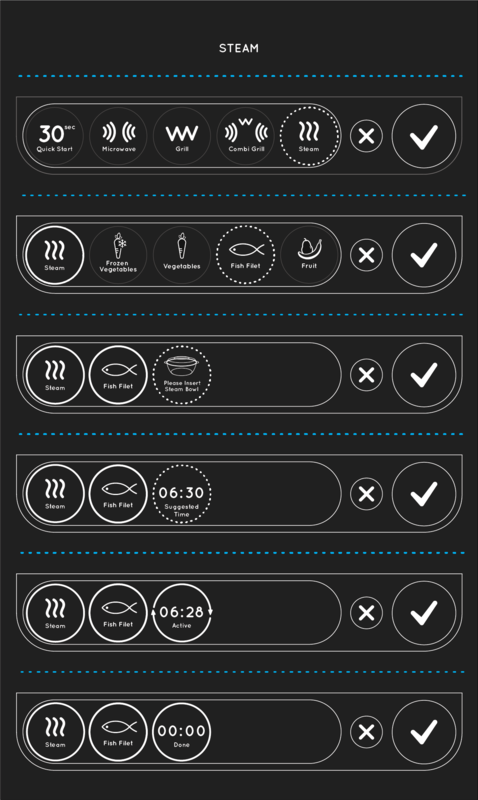 The screen has five bubbles representing the options, each with an icon and name. The biggest button can be used to scroll through the circles and select one. The selected bubble slides to the left and new, underlying options appear. The circles on the left portray a settings-timeline. The available options-structure is based on a new flowchart that was developed to improve the flow, and simplify the steps. 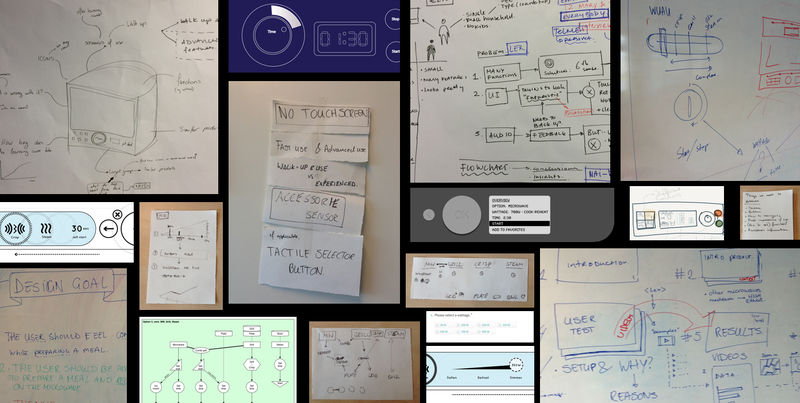 Redesigning the interface by brainstorm, drawing and making mock-ups. We’ve done extra research to elaborate more on the wattage selection. From our survey, we concluded that people feel most secure when selecting a wattage when it is abstracted and explained. We pioneered a new way of setting the wattage by combining a visual representation with the wattage values and explanatory words. Then we built a prototype, which gave us the chance to test our redesign with a second user study. The results from study two were mainly about refinements as the redesign was generally liked. The prototype of our redesign. We’ve restructured some functions again and improved the wattage selection even further. We’ve also removed causes for insecurity like setting a time value by going back to the Whirlpool MAX 109’s original 6th Sense food options. The new interface on the Whirlpool Bubble. We also removed a button, resulting in just two buttons: a back-button and a scrolling confirm-button. We can conclude that we met our design goal, as we included a questionnaire in our second study. The participants scored our redesign with an average of 5.8 out of 7 for clarity, 5.3 out of 7 for reliability and 5.8 out of 7 for satisfaction. Our final design has a titled front to make the aesthetics friendlier and improve readability. Product for Whirlpool, and TU Delft from 2014. Team effort with fellow creators Nai-Dan Chang, Emma van Dam, Telmen Dzjind, and Calliope Savvaki. In this team I participated in all aspects, including conceptualising, prototyping, testing and designing the new interface and documenting the final report. Course: Usability and User eXperience Assessment in Design. 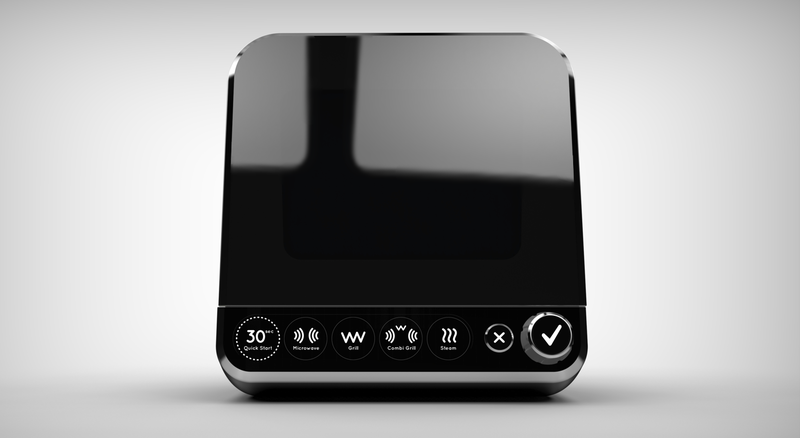 Assignment: Redesign the Whirlpool MAX 109 to improve its usability. Want to know more about Whirlpool Bubble? Don’t hesitate to email me.